The Rev. Alberto Cutié gave the sermon at the Episcopal Church of The Resurrection in Miami. Episcopalian priests can marry, unlike their Catholic counterparts. He had barely said good morning when Cutié received a standing ovation. A handful of people held their personal cameras in the air, capturing what they could. He then delivered a sermon that spoke of common themes — God’s love, faith and perseverance — with a few lighter moments referring to his leaving the Catholic church thrown in. In his sermon, Cutié spoke of a sea captain lost at sea for so long he ran out of water for his crew. Then another ship came by and told the ships crew to lower their buckets. The captain thought this was crazy. Except, it turns out, the ship had wandered into an area with fresh water. It was a theme he returned to several times — the love of God is here for all. But first we must lower our buckets. For the past month the debate in my comments section has raged on, and the comments have become increasingly vicious. It’s time they stop. We need to draw from the waters of human kindness, to use Alberto’s metaphor. Padre Alberto has made a decision that I feel is the right decision, and the best decision for him. The time for the debate has ended as far as my blog goes. FROM NOW ON I WILL REJECT ANY COMMENTS MAKING UNPLEASANT OR OBNOXIOUS REMARKS ON PADRE ALBERTO. You are welcome to offer support and encouragement to Padre Alberto, which he will need in the years to come. All other comments will be deleted. Commenters at this blog are my guests and if you have bad things to say about this good man, you can start your own blog. Susan Boyle lost Britain’s Got Talent to the ten-person dance crew Diversity. “Lads, I wish you all the best,” said Boyle graciously. It was a stunning loss. Boyle took second place in the voting. Now, if we get Pilobulus to dance to hip-hop, and change their name to PC, as in politically correct, we’ve got a winner! In the meantime, let’s hope someone signs up Susan Boyle as Mama Rose in Gypsy. Everything’s coming up roses! Susan Boyle, the undisputed star of Britain’s Got Talent, is on course to make more than £5 million from television, advertising and record deals. My latest article, Venezuela: Chávez’s Persecution, and No Debate, is up at Real Clear World Please read it and leave a comment. Hugo Chávez, rambling as usual in his Aló Presidente TV show (whose 10th anniversary he is celebrating with a 4-day long cadena, as if Venezuelans hadn’t suffered enough), said on Friday that he was willing to debate the speakers at the Cedice conference (prior posts here and here). 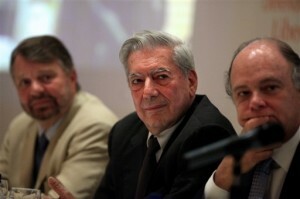 Cedice participants Mario Vargas Llosa, Enrique Krauze, and Jorge Castañeda agreed to debate Chávez himself, on the condition that there be equal time for their points so that they wouldn’t be sitting there listening to Chávez rant. I have met Mario Vargas Llosa and Enrique Krauze, and they are top intellects. Brilliant men, each of them. Now, Chávez, self-deluded as he may be, does have a flash or two of lucidity, and decided this debate was not a good idea after all. He cancelled today’s show without further explanation. 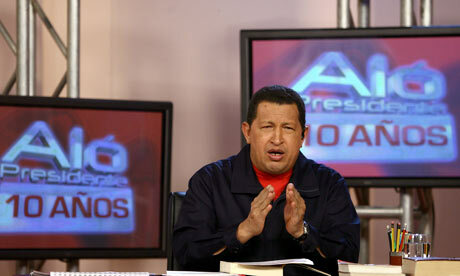 I have an article coming up soon at Real Clear World with more background on Chávez’s current oppression. Obama: What do you do Walter? Obama: Outstanding, how long you been doing that? Walter: Uh, we work with, uh, satellite imagery..
Obama: Sounds like good work. Not.A.Clue. Daily intelligence briefings? Who knows? Where’s that TOTUS when you need it? The Obama Justice Department told the Supreme Court this evening that the Uighurs have no right to be released into the United States. The Uighurs, Chinese Muslim detainees held at Guantanamo Bay, received terrorist training at al Qaeda affiliated camps (from an organization formally designated as a foreign terrorist organization under U.S. law) and were captured after the U.S. invasion of Afghanistan. They are the Left’s combatant cause célèbre. The military took the incoherent position that they were trained al Qaeda terrorists but that their real beef was with China, not us. Thus, the federal courts have held that they are not enemy combatants. The government has been trying to relocate them for years but no country will take the remaining 17 — other than China, where our treaty obligations arguably forbid us from sending them because there is reason to believe they’d be persecuted. Of course, it’s one thing to say that they are not enemy combatants and should therefore be released. It is quite another thing, though, to say that they should be released into the United States (which, because of their terrorist affiliations, would violate federal immigration law). The Uighurs appealed, and today the Justice Department filed its responsive brief. Solicitor General Elena Kagan argued — consistent with the Bush administration position — that the Uighurs have no right to be released into the U.S.
European nations are clamoring for the U.S. to accept some of the Uighur detainees in return for accepting some themselves. Bottom line: the Uighurs have no right to be released into the US. The Beeb says ‘Glass hold’ reveals personality. This type of drinker could be a man or a woman. They tend to be sociable and convivial and “like a laugh”. They take short swigs from bottled drinks so they don’t miss out on chipping in with the conversation. The bottle is held loosely at its shoulder for ease. This type of person is always happy to extend their social circle. The best way to approach them therefore is to leap directly into light, good-humoured conversation and make them laugh. However, it’s probably a good idea to stay away from the browbeater, whether the study is accurate or not.